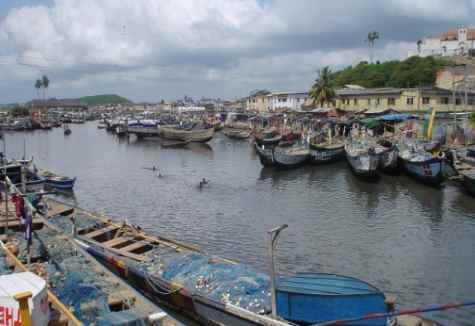 Cape Coast, Ghana, also known as Cabo Corso, is actually the capital of Ghana's Central Region and is actually the top tourist destination in the country of Ghana. It is also the capital city for the Fantes, also known as Mfantsefo. The Fante people call the city Oguaa. The city itself is about 165 km away from Accra and is located right on the Gulf of Guinea. With more than 80,000 people, the city has definitely changed from what it used to be a few hundred years ago. The city has a long history and is actually one of the most historical cities that you'll find in the country of Ghana today. It is rich with history, culture, and a variety of wonderful tourist attractions to enjoy. The history of this beautiful city on the coast is definitely long and rich. From the 16th century on, the city actually changed hands between the Dutch, British, Swedish, Danish, and the Portuguese. 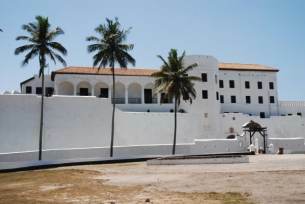 Portuguese and was actually built around the Cape Coast Castle. The Dutch were the ones that converted it into a castle in the 1600's, then the Swedes would later expand it, only to have it captured in 1665 by the British. The Gold Coast operations of the British were based from this castle and city until later in 1877, Accra would become the capital. 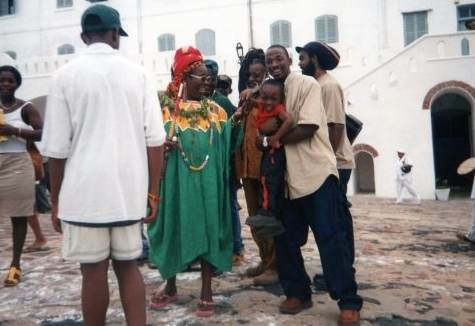 Also, it was this city where many slaves were held, in the Cape Coast Castle, before going on to the Middle Passage. The culture in this Ghanaian town is actually quite a bit more laid back than it is in other parts around the country and tourists find the area to be very laid back. As the capital for the Fante people, the culture is rich, and you'll find that they love their festivals. You'll find that just in other cities across Ghana, that there is a wealth of dance and traditional music marking these celebrations, festivals and rites. Some of the top festivals you'll experience in this city include the biennial Panafest theatre festival as well as the Oguaaa Fetu Afahye harvest festival. The Fetu festival is held on the first Saturday during September and has been a tradition for many years. Rituals are held, dances are danced, and food is consumed. A bull is also slaughtered during the festival for purification as well. Then on Sunday, a church service is then held and thanks is given to God for helping the people through the year and the festival as well. Believe it or not, the top university in research and teaching for the country of Ghana, the University of Cape Coast, is located in this city. It is located on a hill that overlooks the Atlantic and is well known as Cape Vars. Various other top technical and secondary schools in the country are located in Oguaa. Some top ones are Adisadel College, Ghana National College, Wesley Girls' High School, Cape Coast Technical Institute, Aggrey Memorial AME Secondary School, St. Augustine College, and Holy Child Secondary. Mfantsipim School also known as THE SCHOOL was the first secondary school in Ghana and it is centrally located downtown (koto-kruaba) Cape Coast. This is actually the high school I attended. When it comes to tourist attractions in this beautiful city of culture and history, you'll find that the Cape Coast castle is a must see. It is actually one of the biggest slave trade castles in Ghana and contains a very organized and interesting historical museum as well. were held in dungeons hundreds of years ago. Photo taken from just outside of the 'Door of no return' at cape Coast Castle. It is an experience you won't want to miss, not to mention the amazing views of the Atlantic Ocean from the castle. 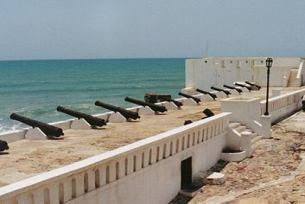 There are two other forts in Cape Coast that are definitely worth visiting as well - Fort William, Fort Amsterdam and Fort Victoria. The Cape Coast Centre for National Culture is another tourist attraction that you'll want to take the time to visit too. The Kakum National Park and the Assin Attadanso Resource Reserve are also a places to visit if you want to appreciate nature at it's best. There are exceptionally tall tress with a diverse species of mammals, birds, and insects. At Kakum park, about 30 minutes from the town, you can walk on the rope constructed bridges looking down the canopies of some of the tallest trees in the world and admiring the big mammals like elephants below. Its like 'air walking' which is equivalent to the Sky Walk of the Grand Canyon in Nevada. Adrenaline Fun is what I call it. I'm scared of heights to death but I had a good time with my friends, although my legs were shaking throughout on the canopy ropes. Some of the activities these places offer are walking tours, guided hiking, bird watching and of course the almighty Canopy Walk. On your way back, you can stop to dine or refresh your self at Hans Cottage Botel. This is an all in one place, I mean they have bed and breakfast rooms, bar and restaurant and a crocodile pond located right beneath the restaurant. Eat and drink and watch crocodiles at the same time, same place. Where else can you see this? the the Coconut Grove Hotel. Now you know, Cape Coast has so many things to boast of so don't forget to have a glimpse of what its all about when you discover Ghana my motherland.